In the summer of 1939, East Baton Rouge Parish began studying sites for a new airport that could accommodate longer runways to replace the downtown airport on Goodwood Boulevard. 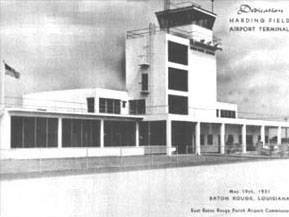 The site of the current Baton Rouge Metro Airport was chosen, but before construction was complete, the U.S. Army expressed an interest in leasing the airport in December of 1940. The war in Europe had been underway for over a year, and more airfields were needed in the South. The Baton Rouge airfield was in a good location to defend the numerous refineries on the Mississippi River, and airport construction had already begun. The airport was subsequently leased to the U.S. Government for use as an Army Airbase. The airport was officially named "Harding Field" on January 22, 1942. The name selected was to honor Lieutenant William Harding, a distinguished pilot and Olympian from Shreveport, Louisiana, who was killed in a plane crash during war games in August of 1936. William Wadley Harding was born in Shreveport, but his family later moved to California. Bill Harding was a star athlete in High School, but he also excelled in the classroom. Harding played football and water polo at Compton Junior College. While at Compton, he saw a movie about WWI pilots and their aircraft called "Wings," which led to his interest in becoming an aviator. Harding later transferred to Stanford, where he participated in boxing and joined the rifle team. He was a member of the U.S. Olympic Rifle Team in the summer games of 1932 in Los Angeles. He shot the highest score on the U.S. team and won a Bronze Medal. After graduation, Bill Harding joined the Army Air Corps and pursued his dream of becoming pilot. He flew the Boeing P-12B bi-plane. His expert marksmanship combined with his flying skills led to his dream assignment as a pursuit pilot. He later flew the famous P-6E Hawk Fighter plane, the most advanced Air Corps bi-plane. Open cockpit fighters were the bulk of the U.S.'s pursuit planes in the mid-1930s and until the beginning of WWII. Soon after Harding became a squadron leader, the 1st Pursuit group received the new, state-of-the art PB-2A. The PB-2A had a G.E. turbo supercharger engine and included "firsts" such as aluminum skin, retractable landing gear, and an enclosed cockpit covering its pilot and rearward facing gunner. William Harding was leading a flight of six PB-2As on maneuvers to practice dive-bombing and ground attack techniques at Selfridge Field in Michigan when the engine failed and caught fire. Harding's mechanic, Pvt. Frank Miller, had asked to go up with him. After lowering the aircraft nose to gain airspeed and avoid a stall, Harding looked back to discover that Miller was unconscious from the G forces of the last dive pullout. With the spreading fire obscuring forward vision and the fighter losing altitude, they would have to bail out. After sliding the canopy back at 1500 feet, Harding was eventually able to wake his friend and get him out along with himself. However, the PB-2A had lost more altitude and was too low for either man's parachute to open. William Harding sacrificed his only chance for survival by staying with the burning airplane and trying to save his friend. Harding Field operated for four years as a training base for fighter pilots flying the newest planes and bombers during World War II. The air base served as a temporary home for thousands of men and women from around the country. A number of the pilots who received their training here made history in the aviation industry. Entire units were trained and sent overseas including quartermaster units as well as fighter and bomber squadrons. Men from Harding Field were in every theater of the war and distinguished themselves with the highest honors. For women, the base was indeed a "training” ground and an entry into the workforce of industry serving as both officers and as civilian employees. The City of Baton Rouge was already prospering from industry, but the war accelerated development, pouring millions of dollars into the local economy. The new base proved to be an economic bonanza to the city. Base operations relied on vital supplies purchased from businesses outside of the base. Monthly pay from personnel stationed at the base amounted to approximately $50,000. This did not include the many civilian personnel employed in the base offices, hospitals, warehouses, mechanics and carpenters. 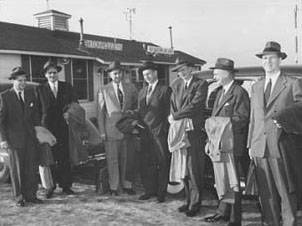 In August of 1948, under the US Surplus Act of 1944, for the disposition of government surplus airports, airport facilities and equipment, and to assure their disposition in such a manner as would best encourage and foster the development of civil aviation and preserve for national defense purposes a strong, efficient, and properly maintained nation-wide system of public airports, Harding Field became a public airport for civilian use serving the Baton Rouge Metropolitan area. The City-Parish Government saw fit to create an Airport Authority by establishing Act No. 151 of the 1969 Louisiana Legislative Session. It was then that The Greater Baton Rouge Airport District came into existence. Members of the Authority consist of the Mayor-President and Council of the Parish of East Baton Rouge. Seated under this Authority is a twelve member advisory "Board of Commissioners" which is responsible for recommendations to the Authority for the operation and administration of the airport, and as the Governing Authority of the district as authorized in Act 151. However, the Airport Authority retains the power to suspend or rescind any action or proposed action by the Commission. The Baton Rouge Metropolitan Airport is an agency of the City-Parish Government; however, it operates as an enterprise fund and generates its own revenues. It does not receive money from the City-Parish general fund and therefore is self-supporting. Today the Baton Rouge Metropolitan Airport serves an MSA of over 830,000 people and a total catchment area of approximately 1.7 million in south Louisiana and southwest Mississippi. Frequent flights provided by American, Delta, and United to some of their largest hub airports provide single-connection service to destinations worldwide.